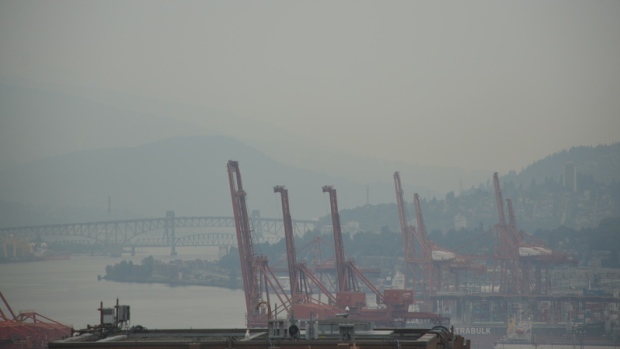 Metro Vancouver authorities has issued an air quality advisory for Metro Vancouver and the Fraser Valley Regional District due to wildfire smoke from Washington state. The smoke has drifted into the region, bringing high concentrations of fine particulate matter — tiny airborne solid or liquid droplets — which can cause health problems. Stay indoors in a cool, air-conditioned environment and reduce indoor sources of pollution such as smoking, vacuuming and use of wood stoves. Take shelter in air-conditioned buildings which have large indoor volumes and limited entry of outdoor air. Exposure is also a concern for infants, the elderly and those who have diabetes, and lung or heart disease. Residents are advised to stay cool, drink plenty of water and avoid busy roads and areas with wood smoke. This advisory is expected to continue until Wednesday when rain showers are forecast throughout the region. It follows a now lifted warning issued in July due to high concentrations of ground-level ozone. More information about real-time air quality readings for Metro Vancouver and the Fraser Valley communities and potential health impacts can be found at http://www.airmap.ca and www.bcairquality.ca. What’s been causing Western Canada’s recent smog alerts and poor air quality? The answer lies somewhere between forest fires and upwind. Canada’s western provinces have been on the radar. July was a month of tornadoes, heavy rainfall, and forest fires in Canada, leaving behind a series of air quality advisories travelling from the western provinces into the prairies. 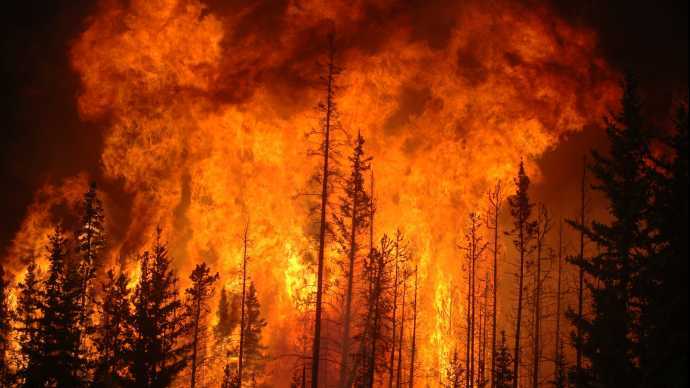 Then came the questions: How do forest fires in British Columbia and the Northwest Territories affect the air in Saskatchewan? Are certain provinces more prone to poor air quality? What should people do to protect themselves during air quality advisories? The Weather Network’s digital meteorologist Scott Sutherland helped answer some burning questions. As part of the natural cycle of forest regeneration, every year the Northwest Territories sees thousands of hectares of wilderness enveloped in flames. This year’s fires, however, have been some of the worst in the region’s history. In an interview with the National Post, Mike Flannigan, wildland fire professor in the University of Alberta’s renewable resources department, says that this year’s fire season is one of the worst on record, and that conditions in the future are likely to be even worse. But it’s not only the spread of fire that had people worried. As the flames erupted, smoke was pushed so far south that it has drifted thousands of kilometres into the U.S. border, and farther east through the prairie provinces of Canada. The smog and smoke have left Canada’s western provinces in a state of frequently emerging air quality advisories. Provinces in western Canada, on average, tend to have cleaner air than eastern provinces. This is mainly due to the fact that the air flow that Western provinces receives comes from an area that tends to be cleaner, coming in from the ocean. According to The Weather Network’s meteorologist Scott Sutherland, generally, the area most known for its poor air quality spans from Windsor to Quebec City, primarily due to the Ohio Valley. “The highly industrialized and urbanized Ohio Valley, along with the plentiful coal-burning power plants, tend to mean a lot of air pollution for the eastern half of the country as winds carry this pollution across the border from the U.S,” Sutherland says. By contrast, the wind flow into BC (also known as “upwind”) tends to come from over the ocean, and the flow that travels through the Prairie provinces tends to come from the Midwest and the mountains, which, Sutherland adds, just don’t have the same concentration of industrial pollution sources. In fact, air quality can worsen each day as more pollution is added to the mix. Stagnant weather patterns are the cause of this, enabling local pollution to situate in the same area. So how do forest fires come into the mix? Sutherland says the smoke from forest fires is composed mostly of a fine particulate matter – one of the major components of smog. The gases emitted into the atmosphere by the burning can also produce ozone, which another major component of smog. Naturally, the result of forest fires is the emission of greenhouse gases in the atmosphere, causing pollution in the downwind smoke plume – hence the emergence of air quality advisories as far as Saskatchewan, following the BC forest fire. Sutherland says the major determinants of how much a forest fire can impact bordering provinces are the size of the fires, the amount of smoke produced, how long the fires last, and what wind the direction blows. Weather patterns often move from west to east, but the surface winds that often pick up the smoke are a bit more unpredictable. “The smoke could end up blowing down through the mountain valleys, out to sea where it won’t affect anyone, out to sea, and then back on land, affecting the coast, or possibly down to the Prairie provinces,” Sutherland says, referencing B.C. and the Northwest Territories’ recent fires. Finally, the most important question – what should the public do in the event of an air quality advisory? Sutherland notes that the major risks are all about concentration and exposure time. The more severe the smoke is in a specific region, even a small amount of exposure can send people to the emergency room with respiratory-related injuries. Long-term exposure to high concentrations can be fatal, while being exposed to low concentrations for long periods of time can cause health problems, possibly even reducing a person’s expected life span. Canada’s Air Quality Health Index (AQHI) tracks short-term impacts, while the Canada-wide standards (CAAQS) covers long-term. Ideally, when an air quality advisory is issued, the public is generally advised to limit the amount of time spent outside. The concern is even higher for those suffering from asthma, lung disease, heart disease, or similar problems. Air quality advisories have the potential to affect multiple provinces, even though they often begin situated in one location. Flat areas like the Prairie provinces are not so prone to bad air quality – even if the air does flow down from the west and remain stagnant, the wind flow will usually carry that air east bound. In Vancouver and parts of B.C. where mountains are blocking the flow of air, pollution and smog can become easily trapped, making certain geographic regions more prone to stagnant, poor air quality. But once bad air quality travels, it can be carried by wind and brought as far east as the Maritime provinces. As for forest fires, we’ll have to keep our fingers crossed. Sutherland says the western part of the continent is currently under a dry spell, making it highly susceptible to forest fires. In areas that are densely forested, sometimes all it takes is a strike of lightning.